Elayne Kuehler states, “I am Baton Rouge native, and known for being a romantic realist with a passion for capturing the beauty I see in life. I strive for the truthfulness of colors and designs that nature provides. My still lifes are painted directly from life. Landscapes are started on location and finished in my studio. Nature is the best teacher and her beauty can’t be topped. My chosen medium is oil but I love to work in pencil and enjoy gouache as well. My forte is painting the still life in oil with traditional landscapes coming in a close second. I find endless still life compositions in my own home, kitchen, and gardens. 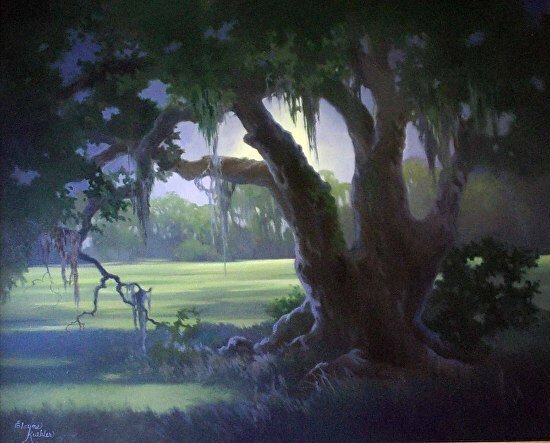 I am absolutely astounded with Louisiana landscapes, especially the ones that encompass the live oak. I find great inspiration indoors and outdoors.